Use these buttons to read the articles. The Square one will open a new page and show whole article. "Maystar Brood - Part 1 of 6"
I was asked by Your Cat Magazine if I would like to take part in the Breeder Diary. It's a six month contract and I will have to write about the goings on at Maystar HQ for the next six months. With Faith due her babies it seemed a fantastic opportunity to show the world about ethical breeding and the pro's and con's of the entire experience. For those following the blogs, you will know some of the endings, but for anyone with a fresh pair of eyes on this subject, it will be a roller coaster ride of emotion. I am very passionate about genetic testing and was peased to be asked to write a little something for the Your Cat Magazine. I feel it is every cats right to be as healthy as possible and live a stress free life. Genetic diseases can be stopped if breeders discontinue or strengthen their lines. It is, of course, not fool proof and any genetic disposition can pop up at any time from as much as 11 generations away. But if two cats can be tested for a disease before they are mated and they both test positive, then it is a full blown conclusion to not continue with that mating. Earlier this year I was contacted by 'Your Cat' magazine to pop together some wording and answer a few questions for Rachel, the author. I never imagined 'all of my text' was rewritten into an article about Devon Rex as well as a beautiful picture of Gracie! When the February issue landed on the door step, it was quite a surprise. I had also recommended a few 'pet rex owners' and it was fab to see Penny Pickering's Rexes in there too. I am the Editor for RexPress and this year I had someone pull out at the last minute with their article. So I stepped in with 'Going Viral'. It is an article I have been meaning to write for some time, and what better place then to add it to RexPress? I was Judging in the Household Pet section and got collared by Polly Hudson from The Mirror. I thought it funny to be interviewed when there were hundreds of Judges that day, I guess they were busy? Here is the link to the article or read below. I was invited onto the Marian McNamee show by a lady I met in my local vets. 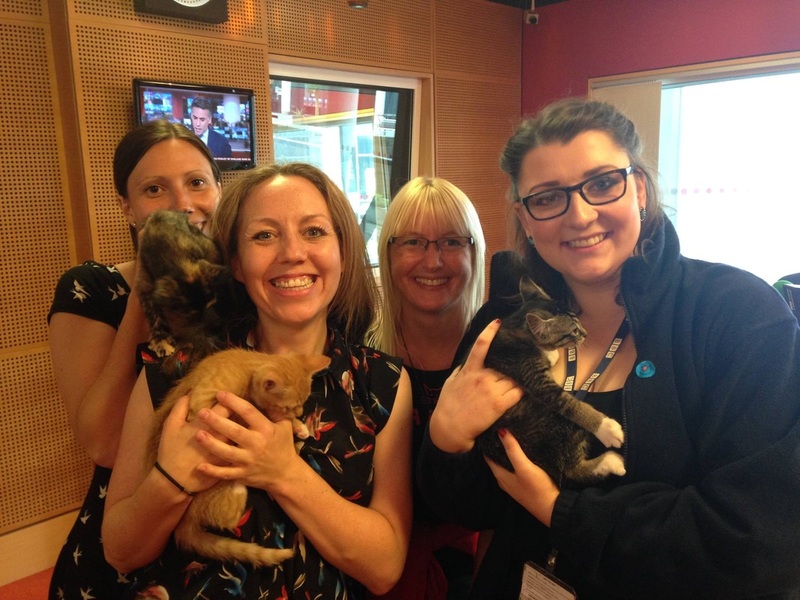 She worked at Coventry & Warwickshire BBC Radio studio and I was telling her about the rescue litter of kittens and she fell in love and said - bring them to the studio! From being at the studio I met Vanessa and she fell in love with Tortee. She came to visit and meet the whole litter and homed both Tortee and her Mum. Vic really liked him and says that he looks a little like Hitler! It's worth a listen and if you listen really carefully you can hear him yawp and Vic notices he fell off the table! Behind the facade... he was running around like a hooligan eating his Noms with gusto whilst I had to control him from wrecking the place!